Round up a heavy morning meal with this robust tea. This popular blend of Kenyan, Ceylon and other choice teas serve as the perfect alternative to your morning coffee. 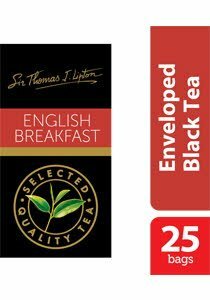 The Sir Thomas Lipton Specialty Tea Collection offers the finest ingredients sealed in envelopes, which maintain quality, freshness and ensure consistency of aroma. The collection helps to create the perfect tea experience for every moment, every occasion including in room (tea corner), breakfast, restaurant, cafe, bar, lounge, banquet and other functions. 1. Place one tea bag for each person in a cup or pot. Pour in fresh boiling water. Allow to infuse for 2-3 minutes. 2. Add in milk, sugar or honey as desired.